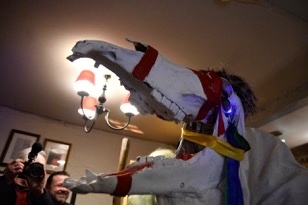 Mari Lwyd came to Caerleon last Saturday night and Hen Galan was celebrated in style. A patient crowd gathered in anticipation outside the Bell Inn – would the magical mare be coming? 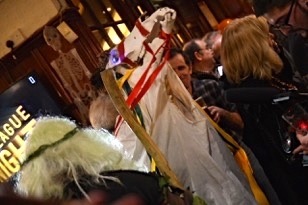 As if by magic the Mari party suddenly appeared and Mari Lwyd “kicked off”. Music and chaos ensued until the party was allowed entry and beer served to horse and human alike. 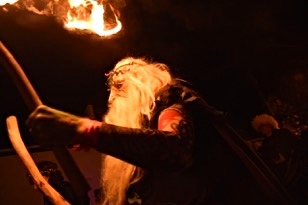 A torch lit procession made its way to the Ship Inn where the celebrations continued before crossing the river to the White Hart. There the Mari party squeezed into a packed pub to amuse and bemuse. 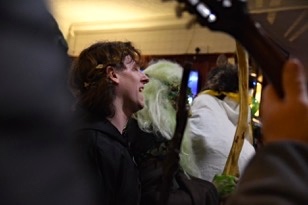 A visit to the Hanbury Arms followed with a concluding performance and Nosen Lawen to the delight of party, punters and of course the Mari – once the cries for cwrw (beer) had been satisfied. 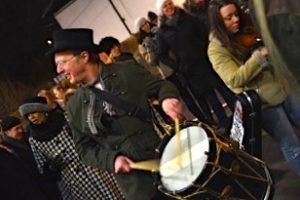 The ancient tradition is now re-established in Caerleon and we can look forward to Hen Galan in 2019. Congratulations to Greville for his drive and determination in organising such a successful evening and reviving the tradition. 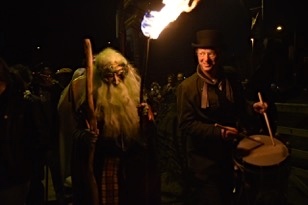 Thanks to all the performers, particularly Yr Hyddgen. Thanks to all the pubs who participated. Thanks to our stewards and in particular Lynne and Pam who tested the generosity of punters and finally thanks to everyone who turned out for a memorable evening.